NOVA Landscape & Design > Blog > Hardscaping > Softscaping > Avoid Contractor Disasters! Who can you trust with your property? We know that hiring a contractor is never easy. There are countless variables to consider, even after you’re confident you’ve found someone capable of making your vision a reality. How will they treat your home? Will they cut corners? Will the project start on time – and will it ever end? At NOVA, our team gets called in all the time to fix problems created by other contractors. Sometimes it’s because homeowners didn’t know what questions to ask. Other times, it’s because they just went with the lowest quote. In those cases, it would always be cheaper – with far fewer headaches – to invest in doing the work right the first time. 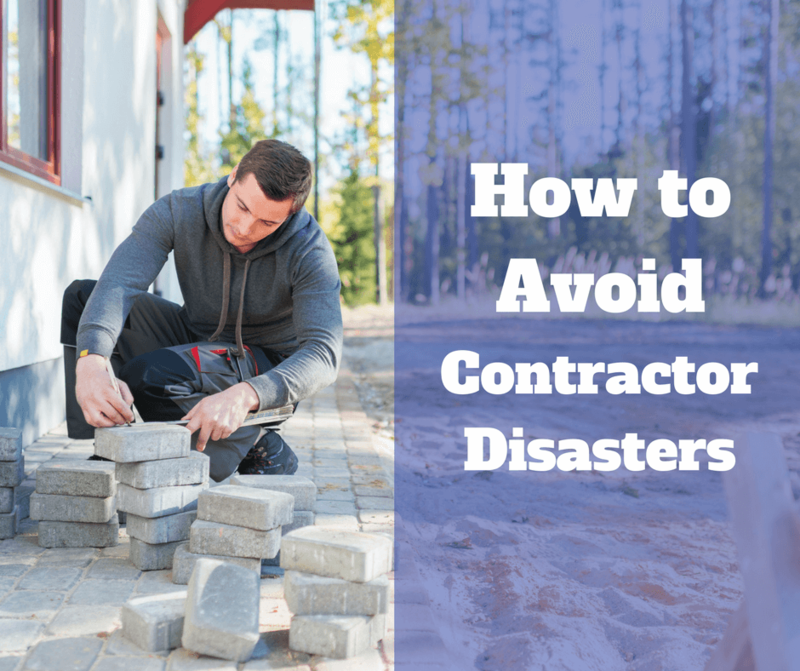 As a cautionary tale, and to protect you as you make your outdoor living dreams a reality, here are some of the types of disasters that can come with hiring a contractor – along with ways to avoid them. Neglecting to Prepare the Foundation – What’s going on underneath your landscaping or hardscaping has a considerable impact on the results you get above ground. From sod installation to a retaining wall, the proper foundation is crucial for the long-term performance and durability of any outdoor living project. The consequences of ill-considered ground preparation can lead to sparse grass or plant growth, leaks, pooling water, cracking, uneven settling, and increased maintenance. The worst part is, you won’t be able to tell there’s a problem lurking below your beautiful new deck or patio until it manifests in damage! Using Sub-Par Materials – It seems like a given that the materials you use to build an outdoor living space would need to stand the test of time and the elements. You’d be amazed at the lengths some contractors will go to for a little savings on materials costs – like using indoor materials for outdoor applications. Using products in a manner to which they’re ill-suited leads to unstable walls, crumbling pavers, and features that lose their luster prematurely. As the homeowner, you should play an active role in choosing the materials, finishes, and even brands being used for your project. Don’t be afraid to ask questions and to make sure your opinion is heard. At NOVA, we only work with proven manufacturers who stand behind their products – industry leaders like Techo-Bloc, Belgard, Nicolock, and Fiberon. Thanks to these trusted names, our own warranties are backed up by stellar products and additional warranties. Blowing the Budget or Deadline – If you’re doing a one-day patio project, there’s only so much wiggle room. When you’re installing an outdoor kitchen or composite deck, however, things can get crazy. Contractors are notorious for adding weeks to timelines and money to budgets. And once ground has been broken, no one wants to pull the plug on a project. It’s best to get all the details, including what happens if things do get out of hand, before your project kicks off. Otherwise, you risk having people in your space or a drain on your bank account for much longer than you’d anticipated. Not Having Enough Experience – Sometimes less-experienced companies will operate on price point. This is a case where you get what you pay for. Only contractors with sufficient experience will be able to plan appropriately, make good decisions in the moment, and navigate the nuances of your project in a way that prevents problems down the road. Remember, just because a company has completed a lot of projects like yours doesn’t mean the master craftsmen responsible for those projects will be assigned to yours. Ask about the structure of your contractor’s team and who specifically will be accountable for ensuring the integrity of your project. The value of expertise goes way beyond “practice makes perfect.” While a portfolio of beautifully completed projects is important, the aspects of experience you can’t see are arguably more valuable. An experienced contractor will have developed the technical logic to consider every aspect of a complex project. They know how to plan to stay on schedule and can manage resources to keep within budget. They’ll also be able to communicate with you, the homeowner, and their team so that expectations are set, met, and adjusted in alignment with reality. Best of all, they’ll be able to minimize the impact when real-world mistakes do happen. One of the best ways to ensure you’re talking to a qualified contractor is to ask for their credentials. Professional certification is meaningful in this industry – ICPI certification is the gold standard for those who install pavers – and you can’t go wrong choosing a certified craftsperson. Visit our resources page for more tips on how to select the right contractor and questions to ask before you hire a team, organized by project type. And if you’re in Northern Virginia and our credentials sound good to you, go ahead and request an estimate. There will be no disasters – guaranteed.